And Genesis doesn't need a performance division to beat the competition. Even though the Genesis brand didn't have any reveals to show here at the 2019 Detroit Auto Show, the company had a lot to celebrate with the . Customers and critics are clearly taking notice of Genesis, so we wanted to take the opportunity to sit down with Erwin Raphael, Executive Director of Genesis Motor America. Of course, Genesis has made a lot of our readers happy by . While it is too early for Genesis to comment on the take rate for the manual, Raphael says "we didn't expect it to be a large take rate. We'll build and ship as many as the market will take." Raphael went on to say the "people who are manual transmission enthusiasts tend to be real auto-car enthusiasts and there's a small number of them but they are passionate. They love it." Clearly, Genesis hears you out there begging for a rear-wheel-drive car with a manual transmission and wants to give you what you've asked for. "The value of having a manual was not to get incremental volume. We do not believe we can make a business case for it. The value is getting these enthusiasts excited for the brand and get them talking about it." Enthusiasts are notoriously difficult to please and some of our readers have questioned why the manual transmission is not offered on the more powerful V6. "Weight," was Raphael's answer. "We tried to make it as pure as possible." The V6 adds significant weight to the front of the car, which may have upset the balance Genesis was looking for. 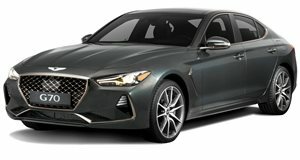 Don't rule out a manual G70 with a V6 though - "we'll see what the demand is like and putting [the manual] in the [V6] is not off of the table." We were also curious to hear about what other performance cars Genesis had up its sleeve for the future, as we have seen . "I do think it is incredibly important to have a sports car - a high-performance, purebred sports car," said Raphael. "Even something with electrified powertrains. We think the market is going that way with the low-end torque. The responsiveness is important for a sports car." Obviously, Genesis would like to steal sales away from the like of Audi, BMW, Mercedes, and Lexus, so it would stand to reason it would eventually release a performance division to battle Audi Sport, M, AMG, and F. Much to our surprise, this is not the case. "We have no plans at this point in time," said Raphael. "We can move the dynamic drive and push it far enough that we don't need a separate division." When asked whether Genesis could eventually compete with the M and AMG cars of the world with 400 or even 500 horsepower cars, Raphael says "I don't see why we couldn't. I don't think we need a separate brand to deliver a car with 500 horsepower. If we can build a G70 that is better than the other brand then if we wanted to build a performance brand we could if we wanted to." So, be on the lookout for future performance cars from Genesis because the Korean luxury automaker clearly has its ears to the ground for what enthusiasts want.